Property investment in Spain can be life changing, and potentially highly profitable, for you and your loved ones. Although making an investment in overseas property may seem daunting initially, the process can be smooth sailing with some basic research, a little knowledge and the support of a trusted Spanish property agent. Here at Spanish Legal Homes, we have helped over 10,000 Brits to safely purchase a property in Spain over the past 30 years. Everyday, we continue to help UK buyers find their ideal property investment in Spain. 2019 is set to be a great year to take the plunge into Spanish property investment. The property market in Spain was clearly on the rise throughout 2018, with leading Spanish property experts widely agreeing that 2019 is set to continue on the same trend. As mentioned in our previous blog post on the Spanish property market, the Tinsa property price index, produced by one of Spain’s largest valuation firms, predicts that both property prices and the number of property sales are set to continue to rise in 2019. These trends indicate that property investors are not finding it difficult to sell up and cash-in on their property investments when they’re ready to do so. The coming year looks set to be a busy year for the Spanish housing market, with strong demand from both domestic and overseas buyers for the right properties in the right locations. For second home buyers, both beach and golf properties will continue to be top of the priority list. To help you get started on your investing journey, we’ve used our experience and knowledge to pull together our top 7 golden rules for making sure that your property investment in Spain is a success. Buying the right Spanish property can be a fruitful and rewarding investment, so it’s important to have a clear understanding of what funds you have available right from the start. Whether you are looking to invest your inheritance, are using savings, plan to relocate to Spain, or you’re using retirement funds, it’s important to have a clear figure in mind. When calculating your available investment funds, be sure to consider the cost of the property plus the necessary additional fees. At Spanish Legal Homes, we are always happy to educate and advise our clients about their options for getting additional finance, either in Spain or in the UK. To maximise your property investment in Spain, there are many benefits to getting extra funding. These include being able to buy quicker, and with an increased budget that could mean you don’t have to compromise on size or location. With low cost finance now available, with interest rates as low as 2%, we’re seeing our clients opt for additional finance more often than ever. If this is something you’re considering for your property investment, our UK based financial advisors can assist you in understanding your options. For more information on financing a Spanish property, click here>>. Browsing popular online property portals, such as Rightmove or A Place In The Sun, can give you an idea of the types of properties that are available. You may even find the exact property that suits your requirements and is within your budget right off the bat. Doing some basic initial research into the different regions in Spain is also a breeze online. Many trusted Spanish property experts, and Government departments such as the Colegio de Registradores, publish market statistics which are easy to find on Google and that can be really useful for highlighting areas ripe for investment. The combination of performing your own property web searches, plus some basic research into market statistics, can give you a good idea of the type of property that you’re interested in, and the regions that could be successful for Spanish property investments. Your initial research can then be shared with your chosen property agents who can then guide your property investment search. Spanish Legal Homes are proud to be an AIPP member (Association of International Property Professionals) so you can be assured that we are committed to upholding professional standards and values when helping our clients with any type of property purchase, whether for investment, leisure or full relocation. This one is key. We always advise our clients to view prospective properties in person, so if you’ve found a property on the web that you like, it’s really important to visit the property before you hand over any deposit. Commonly, properties can be different when you see them in person to how they appear online – it can be difficult to be clear on the property location, what surrounds it, the build quality and interior, room size and overall feel, which is why it is vital to see the property for yourself. To avoid disappointment in your purchase, Spanish Legal Homes provide weekly ‘all inclusive’ Spanish property viewing trips for just £99 per person, which allow UK buyers to view 8 – 10 properties each day that suit their requirements and budget. On our viewing tips, you can get a real feel for the property’s location, size, and the local area, so you can decide if the property really is the right property investment for you. A qualified solicitor is an essential resource to ensure that you make an investment in a property which is legitimate and legal. For many people, embarking on a property investment in Spain is one of the biggest decisions they will make. So to avoid heartbreak, paying for a trustworthy solicitor to ensure that the process goes smoothly and to eliminate stress and worry is worth its weight in gold. We can introduce you to English speaking solicitors that specialise in property, who can help you on your property investment journey. Spain is still top of the list for Brits going on holiday, so as soon as the summer months hit, thousands of British people are on the hunt for properties to rent in Spain that will accommodate them and their family for a week or two in the sun. If you have opted for a mortgage on your property investment, renting it out to people desperate for some Spanish sunshine can be a great way to make some extra money and pay your mortgage off more quickly. Particularly, if you own a property in the popular tourist regions and are happy for your property to be rented during the busy weeks of the UK school holidays, there is great potential to earn extra income. The rest of the year, the property is there for you to enjoy! If you have any questions about property investment in Spain, or you are looking to start your property purchasing journey, please get in touch with our expert team by clicking here>>. 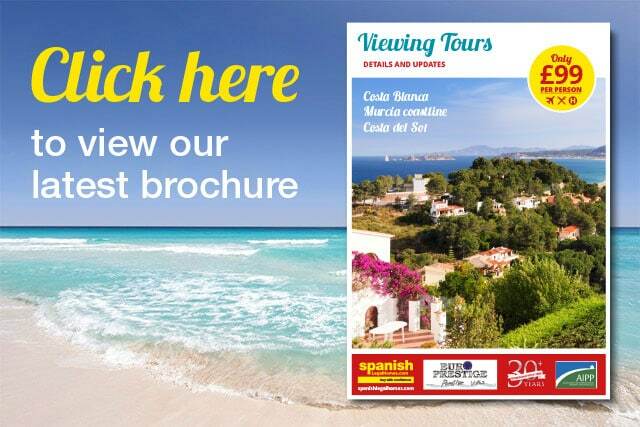 If you’re seriously looking to make an investment within the next year, why not book one of our Spanish property viewing trips for just £99 per person? View Spanish property, the local areas and get all the guidance and advice you need on an all-inclusive trip. Book yours today >>.